Let’s all admit it, archivists may think they’re speaking English but a lot of our terminology sounds like gibberish (MPLP, anyone?) or is industry-specific (e.g., archival value vs. legal value) or can just be misunderstood due to other, non-industry usages (e.g., appraisal–it’s not always about monetary value or processing–we’re not using it in the psychotherapy sense!). Every profession has its unique vocabulary and this post is about an unusual twist to a word that’s used in my profession but not easily understood: recordness. I subscribe to several professionally-oriented listservs, and one that just started a year or so ago is something the Society of American Archivists calls the “Word of the Week.” It’s all part of an effort by a team of SAA members to enhance professional understanding via standardized terminology. This will culminate in a dictionary of terms used in archives and builds on the amazing work of the original “Glossary of Archival Terms” which can be found at http://archivists.org/glossary. 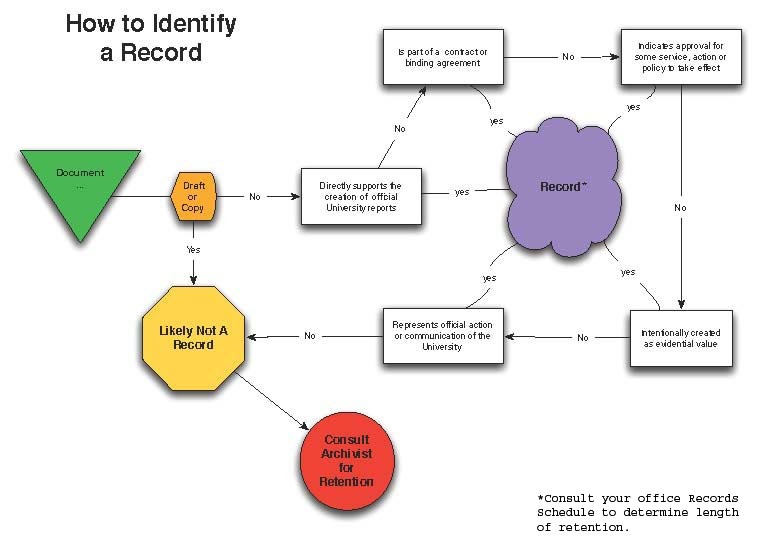 “What kinds of records do you keep” is a common question, and even more “Why isn’t something like a database considered a record?” There seems to be a lot of confusion about the kinds of things that are official records. I created a blog post about them last year and used an image adapted from another archives to illustrate document lifecycles. The definition of “recordness,” just as the definition of “record,” changes according to purpose, law, and context, yet there are some features that most archivists agree are defining features of a record: a record preserves the content of some human action or activity, its content is fixed, and it encompasses at least some of the context needed to make it comprehensible beyond itself. However, meaning is pliable in both the content and the definition of a record. 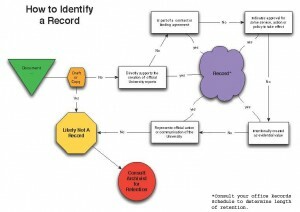 Especially with regard to electronic records, for example, fixity is more a property of ensuring that a record does not change over time after capture by an archives rather than the property that a record (say, in the form of a database or a webpage) does not change during its active use. Bearman, David, “The Implications of Armstrong v. Executive of the President for the Archival Management of Electronic Records,” The American Archivist 56 (Fall 1993): 679. Gilliland, Anne J., Conceptualizing 21st-Century Archives (Chicago: Society of American Archivists, 2014): 170. Kumar, Sushil, Archives: Principles & Practices (New Delhi: Isha Books, 2011): 8-10.Sternfeld, Joshua, “Archival Theory and Digital Historiography: Selection, Search, and Metadata as Archival Processes for Assessing Historical Contextualization,” The American Archivist 74 (Fall/Winter 2011): 549. Williams, Caroline, “Chapter 1: Records and archives: concepts, roles and definitions,” in Caroline Williams, ed., Archives and Recordkeeping: Theory into Practice (London: Facet Publishing, 2013): 14.